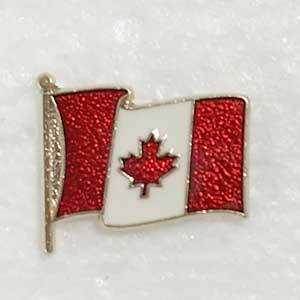 We are your source for high quality Canada Flag pins, Maple leaf pins or Canada/USA crossed flag pins. We can ship them within 48 hours of your order. Our minimum order is 10pc. Your address will be sent to us when you complete the purchase on PayPal. If you wish to combine orders or maple leafs and flags, please contact us. 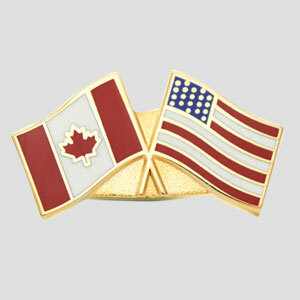 Looking for a custom crossed flag or friendship flag pin CLICK HERE! This is a hard enamel pin with transparent red enamel and a textured background. This pin catches the light, and your eye! This is the pin we take with us on holidays abroad. Shipping: A flat fee of $10 for GROUND shipping will be added to your order total. This is our own waving flag design. 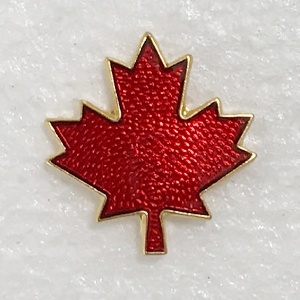 It features a Canadian flag with clear red enamel. The background has an eye catching texture. It really stands out on your lapel!